Fareed Rafiq Zakaria (/fəˈriːd zəˈkɑːriə/; born January 20, 1964) is an Indian-American journalist, political scientist, and author. He is the host of CNN's Fareed Zakaria GPS and writes a weekly column for The Washington Post. He has been a columnist for Newsweek, editor of Newsweek International, and an editor at large of Time. Zakaria was born in Mumbai, India, to a Konkani Muslim family. His father, Rafiq Zakaria, was a politician associated with the Indian National Congress and an Islamic theologian. His mother, Fatima Zakaria, was his father's second wife. She was for a time the editor of the Sunday Times of India. After directing a research project on American foreign policy at Harvard, Zakaria became the managing editor of Foreign Affairs in 1992, at the age of 28. Under his guidance, the magazine was redesigned and moved from a quarterly to a bimonthly schedule. He served as an adjunct professor at Columbia University, where he taught a seminar on international relations. In October 2000, he was named editor of Newsweek International, and became a weekly columnist for Newsweek. In August 2010 he moved to Time to serve as editor at-large and columnist. He writes a weekly column for The Washington Post and is a contributing editor for the Atlantic Media group, which includes The Atlantic Monthly. He has published on a variety of subjects for The New York Times, The Wall Street Journal, The New Yorker, The New Republic. For a brief period, he was a wine columnist for the web magazine Slate. Zakaria is the author of From Wealth to Power: The Unusual Origins of America's World Role (Princeton, 1998), The Future of Freedom (Norton, 2003), The Post-American World (2008), and In Defense of a Liberal Education (Norton, 2015). He co-edited The American Encounter: The United States and the Making of the Modern World (Basic Books) with James F. Hoge Jr. His last three books have both been New York Times bestsellers and The Future of Freedom and The Post American World have both been translated into more than 25 languages. In 2011 an updated and expanded edition of The Post-American World ("Release 2.0") was published. Zakaria was a news analyst with ABC's This Week with George Stephanopoulos (2002–2007) where he was a member of the Sunday morning roundtable. He hosted the weekly TV news show, Foreign Exchange with Fareed Zakaria on PBS (2005���08). 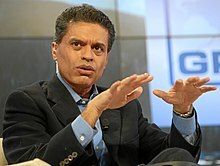 His weekly show, Fareed Zakaria GPS (Global Public Square), premiered on CNN in June 2008. It airs twice weekly in the United States and four times weekly on CNN International, reaching over 200 million homes. It celebrated its 10th anniversary on June 5, 2018, as announced on the weekly foreign affairs show on CNN. In 2013 he became one of the producers for the HBO series Vice, for which he serves as a consultant. Zakaria, a member of the Berggruen Institute, additionally features as an interlocutor for the annual Berggruen Prize. Zakaria self-identifies as a "centrist", though he has been described variously as a political liberal, a conservative, a moderate, or a radical centrist. George Stephanopoulos said of him in 2003, "He's so well versed in politics, and he can't be pigeonholed. I can't be sure whenever I turn to him where he's going to be coming from or what he's going to say." Zakaria wrote in February 2008 that "Conservatism grew powerful in the 1970s and 1980s because it proposed solutions appropriate to the problems of the age", adding that "a new world requires new thinking". He supported Barack Obama during the 2008 Democratic primary campaign and also for president. In January 2009 Forbes referred to Zakaria as one of the 25 most influential liberals in the American media. Zakaria has stated that he tries not to be devoted to any type of ideology, saying "I feel that's part of my job... which is not to pick sides but to explain what I think is happening on the ground. I can't say, 'This is my team and I'm going to root for them no matter what they do.'" 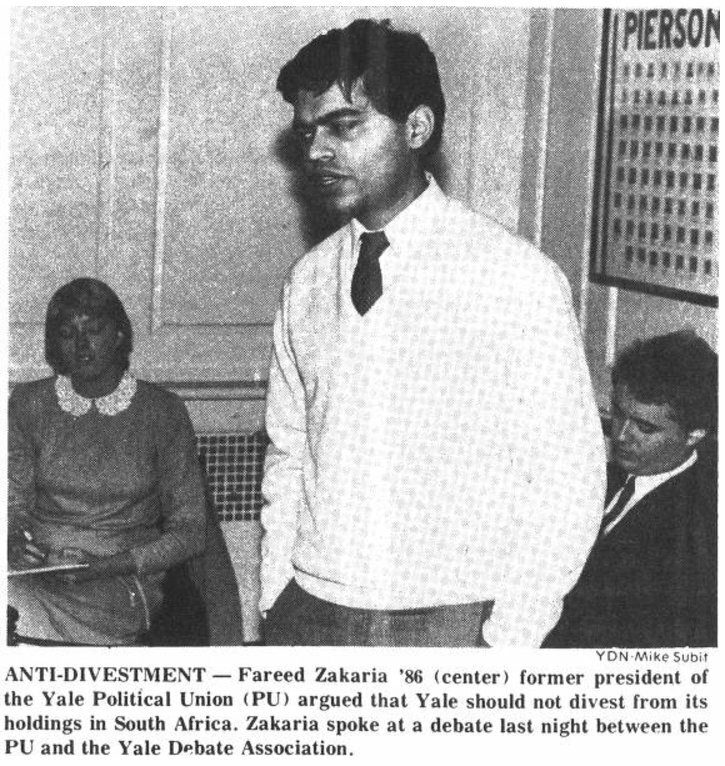 As a student at Yale University in the mid 1980s, Zakaria opposed anti-apartheid divestment and argued that Yale should not divest from its holdings in South Africa. Zakaria "may have more intellectual range and insights than any other public thinker in the West," wrote David Shribman in The Boston Globe. In 2003, former Secretary of State Henry Kissinger told New York Magazine that Zakaria “has a first-class mind and likes to say things that run against conventional wisdom.” However, in 2011, the editors of The New Republic included him in a list of "over-rated thinkers" and commented, "There's something suspicious about a thinker always so perfectly in tune with the moment." Zakaria's books include The Future of Freedom and The Post-American World. The Future of Freedom argues that what is defined as democracy in the Western world is actually "liberal democracy", a combination of constitutional liberalism and participatory politics. Zakaria points out that protection of liberty and the rule of law actually preceded popular elections by centuries in Western Europe, and that when countries only adopt elections without the protection of liberty, they create "illiberal democracy". The Post-American World, published in 2008 before the financial crisis, argued that the most important trend of modern times is the "rise of the rest," the economic emergence of China, India, Brazil, and other countries. 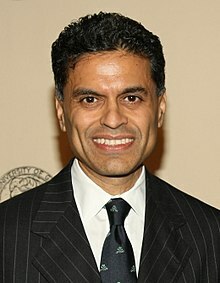 From 2006, Zakaria has also criticized what he views as "fear-based" American policies employed not only in combating terrorism, but also in enforcing immigration and drug smuggling laws, and has argued in favor of decriminalization of drugs and citizenship for presently illegal immigrants to the United States of all backgrounds. Referring to his views on Iran, Leon Wieseltier described Zakaria as a "consummate spokesman for the shibboleths of the White House and for the smooth new worldliness, the at-the-highest-levels impatience with democracy and human rights as central objectives of our foreign policy, that now characterize advanced liberal thinking about America's role in the world." Before the 2008 U.S. presidential election, Zakaria endorsed Barack Obama on his CNN program. In May 2011 The New York Times reported that President Obama has "sounded out prominent journalists like Fareed Zakaria ... and Thomas L. Friedman" concerning Middle East issues. After the 9/11 attacks, in a Newsweek cover essay, "Why They Hate Us," Zakaria argued that Islamic extremism was not fundamentally rooted in Islam, nor could it be claimed a reaction to American foreign policy. He located the problem in the political-social-economic stagnation of Arab societies, which then bred an extreme, religious opposition. He portrayed Osama bin Laden as one in a long line of extremists who used religion to justify mass murder. Zakaria argued for an intergenerational effort to create more open and dynamic societies in Arab countries, and thereby helping Islam enter the modern world. Zakaria initially supported the 2003 invasion of Iraq. He said at the time, "The place is so dysfunctional ... any stirring of the pot is good. America's involvement in the region is for the good." He argued for a United Nations–sanctioned operation with a much larger force—approximately 400,000 troops—than was actually employed by the administration of President George W. Bush. However, he soon became a critic. In addition to objecting to the war plan, he frequently criticized the way the Bush administration was running the occupation of Iraq. He argued against the disbanding of the army and bureaucracy yet supported the de-Baathification programs. He continued to argue that a functioning democracy in Iraq would be a powerful new model for Arab politics but suggested that an honest accounting would have to say that the costs of the invasion had been much higher than the benefits. He opposed the Iraq surge in March 2007, writing that it would work militarily but not politically, still leaving Iraq divided among its three communities. Instead he advocated that Washington push hard for a political settlement between the Sunni Arabs, Shia Arabs, and Kurds, and begin a reduction in forces to only 60,000 troops. He later wrote that the surge "succeeded" militarily but that it did not produce a political compact and that Iraq remains divided along sectarian lines, undermining its unity, democracy, and legacy. Zakaria has been nominated five times for the National Magazine Award, and won it once, for his columns and commentary. His show has won a Peabody Award and been nominated for several Emmys. He was conferred India Abroad Person of the Year 2008 award on 20 March 2009, in New York. Filmmaker Mira Nair, who won the award for year 2007, honored her successor. He has received honorary degrees from Harvard University, Brown University, Duke University, Johns Hopkins University, the University of Miami, Oberlin College, Bates College, and the University of Oklahoma among others. He was the 2000 Annual Orator of the Philomathean Society of the University of Pennsylvania. In January 2010, Zakaria was given the Padma Bhushan award by the Indian government for his contribution to the field of journalism. He has served on the boards of the Council on Foreign Relations, Columbia University's International House, City College of New York's Colin Powell School for Civic and Global Leadership,among others. He was a trustee of Yale Corporation, the governing body of Yale University and the Trilateral Commission. In his 2006 book State of Denial, journalist Bob Woodward of The Washington Post described a 29 November 2001, meeting of Middle East analysts, including Zakaria, that was convened at the request of the then Deputy Secretary of Defense Paul Wolfowitz. According to a story in The New York Times on Woodward's book, the Wolfowitz meeting ultimately produced a report for President George W. Bush that supported the subsequent invasion of Iraq. Zakaria, however, later told The New York Times that he had briefly attended what he thought was "a brainstorming session". He was not told that a report would be prepared for the President, and in fact, the report did not have his name on it. The Times issued a correction. In 2010, in protest at the Anti-Defamation League's opposition to the building of the Park51 mosque and Islamic cultural center two blocks from the World Trade Center site, Zakaria returned the Hubert H. Humphrey First Amendment Freedoms Prize awarded to him by the ADL in 2005. He declared that the ADL's opposition to the mosque meant that he could not "in good conscience keep [the award] anymore". In support of his decision, he stated that the larger issue in the controversy is freedom of religion in America, even while acknowledging that he is not a religious person. He also wrote that a "moderate, mainstream version of Islam" is essential to winning the war on terror, and that moves like the ADL's make it harder for such a moderate version of Islam to emerge and thrive. On 8 August 2010, edition of Fareed Zakaria GPS, Zakaria addressed the issue, stating that in returning his award, he had hoped that the ADL would reconsider their stance. Zakaria was suspended for a week in August 2012 while Time and CNN investigated an allegation of plagiarism involving an August 20 column on gun control with similarities to a New Yorker article by Jill Lepore. In a statement Zakaria apologized, saying that he had made "a terrible mistake." Six days later, after a review of his research notes and years of prior commentary, Time and CNN reinstated Zakaria. Time described the incident as "isolated" and "unintentional"; and CNN "... found nothing that merited continuing the suspension...."
The controversy was reignited in September 2014, when Esquire and The Week magazines reported on allegations made in pseudonymous blogs. Newsweek initially added a blanket warning to its archive of articles penned by Zakaria, but after an investigation of his several hundred columns for the magazine, found improper citation in only seven. Similarly, after allegations surfaced on Twitter regarding the originality of one of Zakaria's columns for Slate, the online magazine appended a notice to the article indicating that, "This piece does not meet Slate’s editorial standards, having failed to properly attribute quotations and information...". However, Slate Editor-in-Chief Jacob Weisberg, who had, months before, exchanged barbs with one of the aforementioned anonymous bloggers on Twitter in defense of Zakaria, maintained his original position that what Zakaria did was not plagiarism. Corrections to selected Zakaria columns were also issued by The Washington Post, which had responded to the initial allegations by telling the Poynter media industry news site that it would investigate. Later on the same day, November 10, the Post said that it had found "problematic" sourcing in five Zakaria columns, "and will likely note the lack of attribution in archived editions of the articles." However, editors at The Washington Post and Newsweek denied that Zakaria's errors constituted plagiarism. Zakaria is a naturalized American citizen. He currently resides in New York City. Zakaria is a self-described secular and nonpracticing Muslim. He added: "My views on faith are complicated—somewhere between deism and agnosticism. I am completely secular in my outlook." In 2018, Zakaria’s wife of 21 years, Paula Throckmorton Zakaria, filed for divorce. The couple has three children. ^ "Padma award recipients Zakaria, Parikh say they are humbled". The Indian Express. 26 January 2010. Retrieved 14 March 2014. ^ "The threat to democracy — from the left". ^ a b c d e "Fareed Zakaria's Website". Archived from the original on 25 August 2010. Retrieved 10 May 2010. ^ Press, Joy (9 August 2005). "The Interpreter". The Village Voice. Village Voice, LLC. Retrieved 10 May 2010. ^ "DNA test uncovers Fareed Zakaria's roots". CNN. Retrieved 1 June 2018. ^ "Harvard Graduate School Honors Daniel Aaron, Nancy Hopkins, and Others". Harvard Magazine. 23 May 2012. Retrieved 29 May 2012. ^ Carr, David (18 August 2010). "Newsweek Notable Moves to a Rival". The New York Times. Retrieved 19 August 2010. ^ Zakaria, Fareed (1 July 1998). "Sweet Justice". Slate. Retrieved 20 May 2008. ^ "Fareed Zakaria to Deliver Lecture on World Issues at Puget Sound Campus". College News. Archived from the original on 15 October 2014. Retrieved 10 October 2014. ^ Binlot, Ann. "Pondering Humanity, Technology, and Net Neutrality at the Berggruen Institute Gala". Vanity Fair. Retrieved 17 December 2017. ^ "Nicolas Berggruen's $1 Million Philosophy Prize - artnet News". artnet News. 17 September 2015. Retrieved 17 December 2017. ^ "Charles Taylor accepts million-dollar prize". Montreal. 2 December 2016. Retrieved 17 December 2017. ^ a b Press, Joy (9 August 2005). "The Interpreter". The Village Voice. ^ a b In Depth: The 25 Most Influential Liberals In The U.S. Media. Forbes. Published 22 January 2009. ^ a b c d e Maneker, Marion (21 April 2003). "Man of the World". New York. Retrieved 16 July 2017. ^ Olson, Robert (January–February 2005). "The Rise of 'Radical Middle' Politics Archived 16 July 2012 at the Wayback Machine". The Futurist, vol. 39, no. 1, pp. 45–47. Publication of the World Future Society. Retrieved 26 February 2013. ^ The End of Conservatism. ^ Shribman, David M. (1 June 2008). "Globalization, its discontents, and its upside". The Boston Globe. Retrieved 16 July 2017. ^ "Over-Rated Thinkers". The New Republic. 3 November 2011. Retrieved 16 July 2017. ^ Khanna, Parag (18 May 2008). "The Rise of Non-Americanism". The Washington Post. Retrieved 13 May 2012. ^ Zakaria, Fareed (3 May 2008). "Excerpt: Zakaria's 'The Post-American World'". Newsweek. Retrieved 16 July 2017. ^ Interview with Fareed Zakaria, Part 1, The Daily Show with Jon Stewart, 28 March 2006: "We are not going to deport them (illegal immigrants)—no democracy would..."Most of these [illegal immigrants], almost all of them, couldn't do anything...that would break the law. The minute they do that, they would be deported." ^ Wieseltier, Leon (25 June 2010). "The realism of seeking democracy in Iran". The Washington Post. Retrieved 16 July 2017. ^ Zakaria, Fareed (19 October 2008). "FAREED ZAKARIA GPS". CNN. Archived from the original on 15 August 2011. Retrieved 22 May 2011. ^ Landler, Mark (11 May 2011). "Obama Seeks Reset in Arab World". The New York Times. Retrieved 22 May 2011. ^ Zakaria, Fareed (14 October 2001). "The Politics of Rage: Why Do They Hate Us?". Newsweek. Retrieved 25 February 2012. ^ a b Zakaria, Fareed (3 April 2007). "The Surge That Might Work". Newsweek. Retrieved 25 February 2012. ^ Fareed Zakaria (1 June 2003). "Giving Peace a Real Chance". Newsweek. Retrieved 10 November 2014. ^ "McCain's Downfall: Republican Foreign Policy". The Washington Post. Retrieved 3 May 2010. ^ Fareed Zakaria (6 June 2009). "Zakaria: How to End in Iraq". Newsweek. Retrieved 1 October 2010. ^ "CNN's Fareed Zakaria: 'Donald Trump became president' last night". The Washington Times. Retrieved 2 May 2017. ^ "rediff.com: Fareed Zakaria is India Abroad Person of the Year". Specials.rediff.com. 21 March 2009. Retrieved 1 October 2010. ^ Koch, Katie; Corydon Ireland; Alvin Powell; Colleen Walsh (24 May 2012). "Eight receive honorary degrees". Harvard Gazette. Retrieved 26 May 2012. ^ "List of Padma awardees". IBNLive. 3 February 2010. Retrieved 1 October 2010. ^ Admin, Website (23 July 2015). "Colin L. Powell School Announces New Board of Visitors". www.ccny.cuny.edu. Retrieved 15 March 2019. ^ DeMatteo, Ann (20 August 2012). "Journalist Fareed Zakaria resigns from Yale Corporation". New Haven Register. Retrieved 23 August 2017. ^ Bosman, Julie (9 October 2006). "Secret Iraq Meeting Included Journalists". The New York Times. Retrieved 16 January 2007. ^ Quote: "An article in Business Day on Oct. 9 about journalists who attended a secret meeting in November 2001 called by Paul D. Wolfowitz, then the deputy secretary of defense, referred incorrectly to the participation of Fareed Zakaria, the editor of Newsweek International and a Newsweek columnist. Mr. Zakaria was not told that the meeting would produce a report for the Bush administration, nor did his name appear on the report." ^ Zakaria, Fareed (6 August 2010). "Build the Ground Zero Mosque". Newsweek. Retrieved 7 August 2010. ^ Zakaria, Fareed (6 August 2010). "Fareed Zakaria's Letter to the ADL". Newsweek. Retrieved 7 August 2010. ^ "Fareed Zakaria returns ADL award in protest". The Spy Report. Media Spy. 7 August 2010. Archived from the original on 13 January 2013. Retrieved 7 August 2010. ^ "Fareed: Don't demonize Islamic centre". CNN. 8 August 2010. Retrieved 9 August 2010. ^ Amira, Dan (10 August 2012). "Fareed Zakaria sure looks like he stole from The New Yorker". New York. ^ "Statement from Fareed". CNN. 10 August 2012. Retrieved 18 August 2012. ^ "Time, CNN suspend Fareed Zakaria for plagiarism". USA Today. 8 October 2012. Retrieved 18 August 2012. ^ Haughney, Christine (19 August 2012). "A Media Personality, Suffering a Blow to His Image, Ponders a Lesson". The New York Times. Retrieved 19 August 2012. ^ Haughney, Christine (16 August 2012). "Time and CNN Reinstate Journalist After Review". The New York Times. ^ Byers, Dylan (16 August 2012). "Fareed Zakaria to stay at Time, CNN". Politico. ^ Hax, Carolyn (16 August 2012). "Fareed Zakaria reinstated at CNN and Time". The Washington Post. Retrieved 18 August 2012. ^ "CNN Does Not Get to Cherrypick the Rules of Journalism". Esquire. 22 September 2014. ^ Cooper, Ryan (22 September 2014). "Why does Fareed Zakaria still have a job?". The Week. ^ "Fareed Zakaria's statement responding to the charges by two anonymous bloggers". Fareed Zakaria.com. 19 August 2014. Archived from the original on 21 August 2014. Retrieved 20 August 2014. ^ Dylan Byers (29 September 2014). "Newsweek adds plagiarism warning to Fareed Zakaria articles". Politico. ^ Taylor Wofford and Zach Schonfeld (7 November 2014). "An Interview With the Anonymous Media Watchdogs Who Accused Fareed Zakaria of Plagiarism". Newsweek. ^ "Editor's note". Slate. 10 November 2014. ^ "Newsweek Warns Readers About Fareed Zakaria's Plagiarism". Gawker. 29 September 2014. Archived from the original on 1 November 2014. ^ a b Grove, Lloyd (12 November 2014). "Can Fareed Zakaria Survive A Plagiarism Firestorm?". The Daily Beast. Retrieved 13 November 2014. ^ "6 of Zakaria's Washington Post pieces have originality issues, critics say". Poynter.org. 10 November 2014. Archived from the original on 11 November 2014. ^ "Post finds problematic sourcing in some Zakaria columns". The Washington Post. 10 November 2014. ^ Zakaria, Fareed (15 July 2001). "America Doesn't Need Crusades". Newsweek. Retrieved 17 July 2017. ^ Zakaria, Fareed (10 December 2015). "I am a Muslim. But Trump's views appall me because I am an American". The Washington Post. Retrieved 13 December 2015. ^ Zakaria, Fareed (12 December 2015). "Fareed's Take: Why Trump's rhetoric is dangerous". Fareed Zakaria GPS. CNN. Retrieved 13 December 2015. ^ Greene, Mikey Light, Leonard. "Wife of CNN 'GPS' host Fareed Zakaria suing for divorce after 21 years of marriage". latimes.com. Retrieved 15 March 2019. Wikimedia Commons has media related to Fareed Zakaria.